2017 has been the year of getting everything I always wanted. Well, not everything... But plant-wise, I did really good. There were a few plants I had on my mental list of "Plants I Have to Have". When out and about, I would always look for them and then not buy them if I saw them. I was pretty good about talking myself out of them for whatever reason. I finally bought Cypripediums at the HPSO sale in the spring. I always thought these hardy orchids were too expensive and that I might kill them. This year I bought two varieties at the Spring HPSO sale (now dubbed The James Lee Hubbard Memorial Plant Buying Spree) and they grew well this summer and bloomed beautifully. The real test will be next spring when I will wait with baited breath to see if they come back. Midsummer, I finally brought home Genista aetnensis (Mount Etna Broom). It's a tiny little fluffy thing at the moment. Hopefully one day it will be a tree. Even in it's tiny form, it still was a check mark off my have to have plant list. I look forward to helping it grow into tree-dom. The last plant I have always wanted was a Fuyu Persimmon tree. At the apartment complex kitty-corner from my office, there are several very nice Persimmon trees. I always thought they were not only beautiful trees, but I looked forward to late fall when our gardener would pop over there and pilfer a few before the apartment maintenance crew would hack them all off. Fuyu fruit are crisp, delicious and not astringent. I prefer to eat them when they are firm but they can also be left to soften and get sweeter. To me, they taste a bit like a cross between an apple and a squash. Perfectly yummy to just slice and eat. On a recent outing with Mardigras Gardener Alan and Assistant Yvette, we were at the Stark Street Portland Nursery. They were having a sale on trees, including fruit trees. 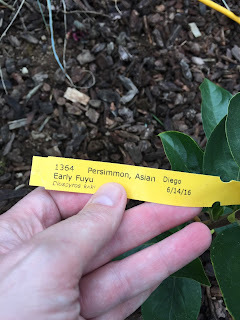 I happened to see a small table with baby Persimmon trees. There were several varieties to choose from. With the sale, the tree was around $20. How could I say no?!? 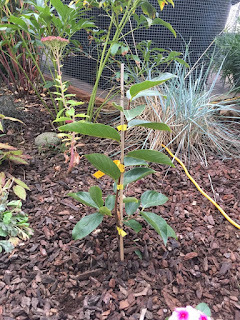 So, I came home with Diospyros kaki 'Early Fuyu'. And more importantly, Alan would have beaten me over the head had I not bought it. He's heard me talk about getting one now for at least 3 years. The thing about buying a tree, was that now that I had it, and could cross it off my plant list, where the hell was it going to go in the yard? My two mantras are "At least its not snowing!" during Portland winter and "No more trees!" for plant shopping. 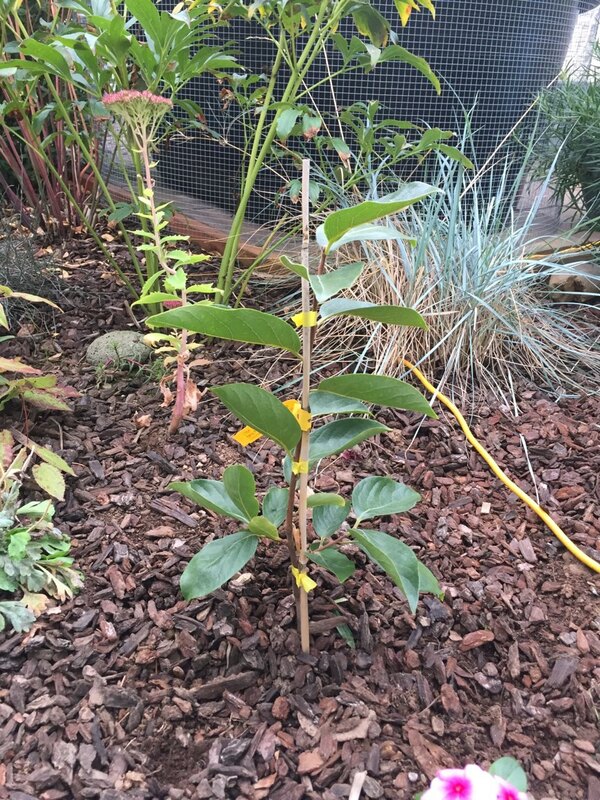 I wondered around the garden holding my baby tree for a bit. I didn't want to "cramscape" it into the garden. I finally decided to do the unspeakable. I dug up a peony on a corner of the back patio! (clutch pearls!). Those that know me and my peony addiction, would know this was a difficult decision. It was an unnamed herbaceous peony that has been given to me, so I felt I could let it go. In this spot a new tree would have the ability to spread out a little. In a moment of brilliance, I gave the peony to a neighbor for his front yard. So although I gave it away, it didn't go far and I can still visit it and take care of it for him. Such a good compromise! It will be several years before I have my own Persimmons to eat. Congrats! I will never forget the first time I saw ripe Persimmons on a tree in Portland. I’d just returned from visiting my brother in Phoenix and all I could thing was grapefruit... very confusing.